Posters were distributed throughout New England. Each ran for a full month, there are 12 in the full set. ScienceToGo.org gave Bostonians the opportunity to learn about climate change in the most unexpected places! ScienceToGo.org is a collaboration led by UMass Lowell that includes the MBTA, UMass Boston, Texas State University, the National Science Foundation, and the Museum of Science. Education can happen in unexpected places, especially with the growing prevalence of smartphones. 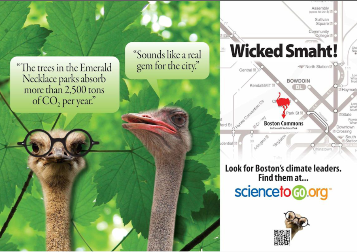 So for 14 months spanning across parts of 2013 and 2014, we explored new ways to share science with the public using “out of home media” by combining posters and placards on the T (Boston’s public transit system) with online resources, social media, and physical exhibits and events around the city. In designing our out-of-home media products, we chose to focus on climate change, one of the most important and challenging issues of our time. The project consisted of an educational campaign and research about it. As educators, our goals were to interest people in climate change, represent clearly and accurately what science has revealed, and help us all think for ourselves. We cared about providing the best information science can offer, but we also recognized that science alone does not answer every question decision-makers must consider, especially when the choices involve trade-offs. As researchers, we aimed to learn about the potential of out-of-home multimedia to foster science learning. We hope you learn from and enjoy our project. Preliminary results suggest that the public noticed and liked the posters and placards. The ostriches proved to memorable and widely appealing. Humor seemed to be an important component for engaging riders, although the text messaging was driven by curiosity about the specific questions we asked. While some riders did visit the website, the transition from signage to online media was a challenge for the project. We did observe some movement in riders’ attitudes about climate change over time; we are in the process of sifting through the results to determine the extent to which our work may be responsible for observed changes. Visit us again or sign-up for email updates about research results, publications, and conference presentations about ScienceToGo.org!